Here are some detail shots from my current favorite project. I rarely get to design something that I would like for myself, but this kitchen hits so many of my buttons at one time I can't help but to slobber all over it every time I visit this job site. This marble is Italian Carrera and I have never seen slabs of Carrera with this many other colors in it. I can't keep my hands to myself! 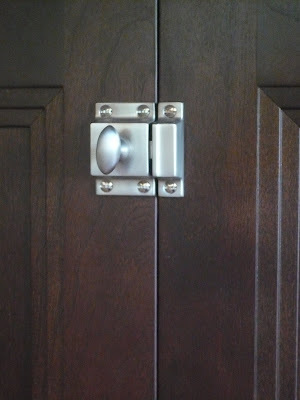 The cabinetry is Medallion Cabinetry's Platinum inset in a dark-stained cherry. The Carrera counters are from Custom Marble Works in Tampa and the hardware's from Restoration Hardware, believe it or not. I am anxious to see a finished photo of this kitchen. I really like the kitchen faucet. I meant to ask when you last sent out photos of the project in December. 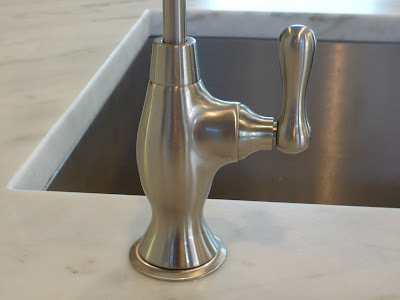 Who makes this faucet? Is that a hot water dispenser next to it? What talent you have! That kitchen is stunning!! I adore the marble! Is it honed or polished? 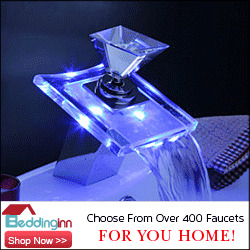 I also love the faucet - who makes that? Great job! What a lucky client! Thank you Ming and Gina, you guys really made my day. 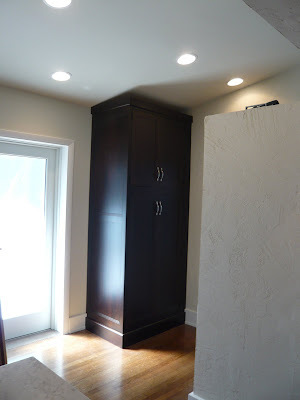 Ming, I'm dying for this one to be done too --the contractor's taking forever to finish the punch out list. In his defense, this kitchen was part of a much larger renovation and the day I was over there for these photos, there was a crew over there re-stucco-ing the entire house. That is an unbranded 18-gauge sink. It's a leap of faith I wouldn't have made, but she lucked out. It's a good, solid sink. To the right of the faucet on that sink is a Kohler filtered water dispenser. The dispenser and the faucet aren't coordinated bu they're close and it doesn't look half bad. 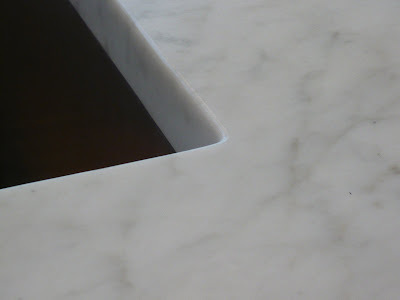 Oh and Gina, that counter is honed Carrera, though there's enough brown in it that it could pass for Calacatta pretty easily. Honed marble is a bit of an obsession with me, I can't get enough of the stuff. 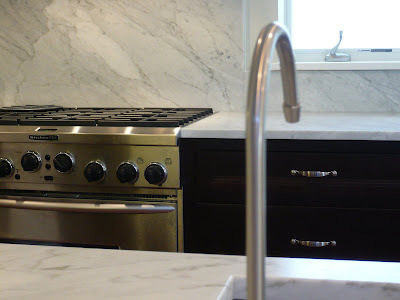 I think honed finishes make marble look better and they're certainly easier to live with than polished finishes. Thanks again to both of you and I will post photos of the completed room as soon as I get into the finished room. so beautiful!! 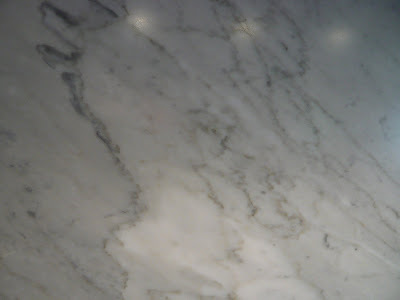 I am in love with white marble myself, but the carrara in Houston has been pitiful lately!!!! i love those deep dark wood cabinets, just beautiful. thank you so much for your kind email today! much appreciated!!!!!!!!!!!!!!!!!!!!!! Thank you Joni! My marble guy has been getting this Carrera that is unlike any I've ever seen for the last couple of months. The marble in this room could almost pass for Calacatta they have so much brown in them. I have a 72" x42" dining table going in next week that uses the same stone as these counters. I cannot wait to see it. You're welcome for the e-mail, you have a great blog!